Emmet does seem like a pickup truck kinda guy. 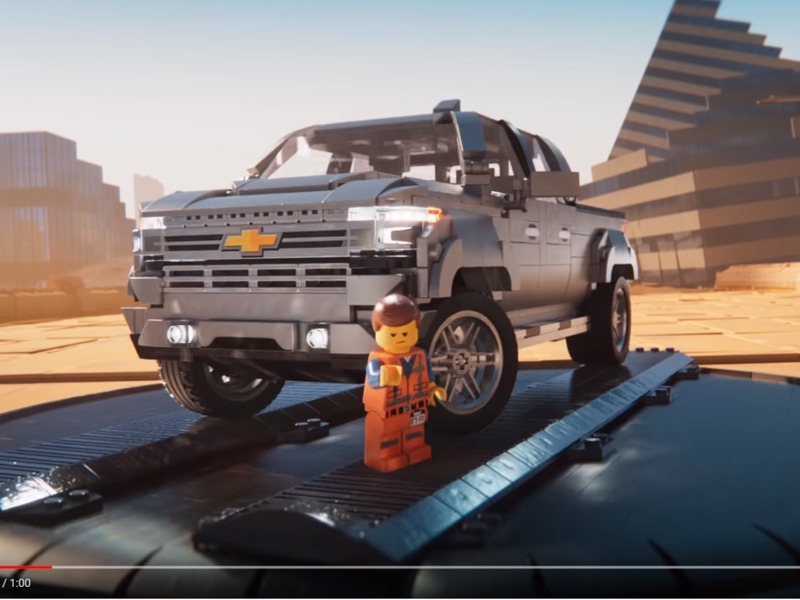 We were thrilled to see LEGO build a full-sized Silverado to promote the new "LEGO Movie 2: The Second Part". Big, red and made with over 300,000 bricks, it was a monumental achievement. Though it would've been nice to see it show up in the movie, it appears there's a different one for the silver screen. It just debuted in this 60-session commercial for the movie and the truck, and it properly captures the childhood fun. In the actual movie, the LEGO Silverado is clad in silver bricks and easily has way fewer than 300,000 pieces (maybe just 300?). The version here is supposed to be the 1500 High Country. Emmet (voiced by Chris Pratt) shows it off to Lucy/Wyldstyle (voiced by Elizabeth Banks) after reassembling their destroyed buggy off-roader in this shameless promotion for the truck (and the film). Emmet extols the virtues and features of the Silverado and both he and Lucy dispatch the enemy in the process. The red Trail Boss built for the Detroit Auto Show was pretty unreal. This whole effort is part of the 2019 Silverado's marketing campaign that's officially in full force. We're sure you'll see it broadcast on the web and on TVs everywhere. The Silverado is currently for sale, and the LEGO Movie 2 opens February 8th in theaters.